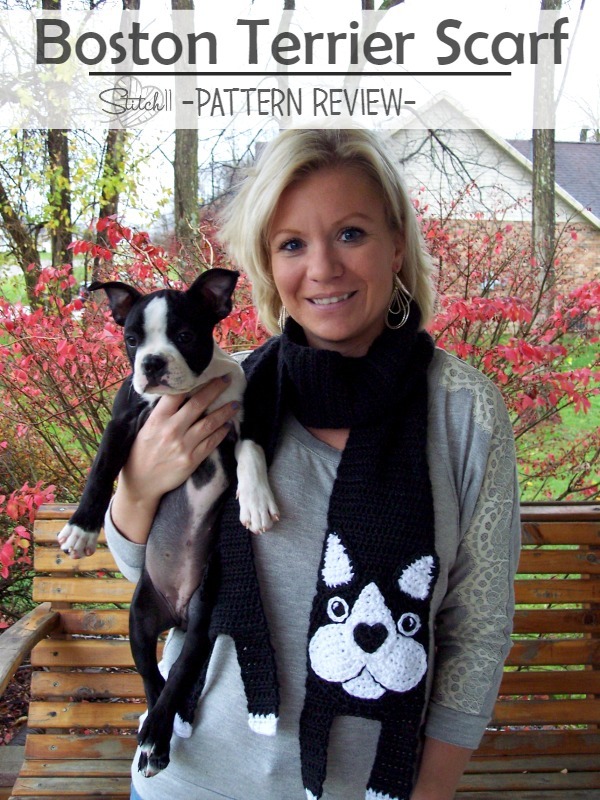 Before I get started on the review- CLICK HERE to get your copy of this awesome Boston Terrier Scarf pattern! The Boston Terrier Scarf is designed by the creative Crochetions. Be sure to follow her on Facebook to get all the newest designs! Tomorrow is my sisters birthday! She has this CRAZY love for Boston Terriers! I like to call her a “Boston Freak”. She has pictures, paintings, wrapping paper, shoes, pajamas, shirts, and now even a scarf in Boston Terrier theme. When I found this design by Crochetions I KNEW it was perfect for my sister!! I paired this scarf with a couple other crocheted scarves and folded them nicely in a box. I made sure to fold the Boston Terrier scarf so it looked solid black. When she pulled it out of the box, a couple legs fell from the fold. She looked very confused! >.< Then she opened the scarf with a GASP and SCREEECH! Her reaction was priceless!!! I could not be more happy with the outcome of this scarf. Crochetions did an amazing job designing it! I used the nose from the hat for this scarf. I also made the eyes all black with a white slip stitch around because I didn’t have the right size safety eyes. Want to check out her other amazing animal scarves? She has a fox, cats, many different dogs, dragons, bacon, pigs and even a sloth! I LOVE THEM ALL!!! Click here to view her patterns on Ravelry!